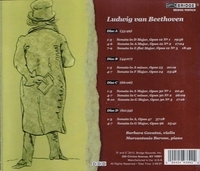 “All but the last of Beethoven's ten violin sonatas were composed in a little over five years. Beethoven returned to the genre one last time in 1812, the eventful year in which he finished his seventh and eighth symphonies, and met Goethe during a sojourn in Teplitz. Violinist, Barbara Govatos, and pianist Marcantonio Barone have partnered on Beethoven's sonatas for many years. Ms. Govatos is a member of the Philadelphia Orchestra, and Mr. Barone is a leading soloist and chamber musician, most active in the Philadelphia area. "A member of The Philadelphia Orchestra since 1982, Barbara Govatos holds the Wilson H. and Barbara B. Taylor Chair of the first violin section. At the invitation of Zubin Mehta, Ms. Govatos has served as assistant concertmaster of the Maggio Musicale Festival Orchestra in Florence, Italy. Ms. Govatos has collaborated as soloist and chamber musician with such artists as Radu Lupu, Riccardo Muti, Christopher Parkening, Wolfgang Sawallisch, and the Emerson String Quartet. She has made solo appearances with the Dallas Symphony, the Chamber Orchestra of Philadelphia, the Juilliard Orchestra, and the Delaware Symphony. In February 2000 she made her Weill Recital Hall début performing the complete Brahms sonatas for violin and piano with Marcantonio Barone, returning for a chamber music recital there with principal players of The Philadelphia Orchestra in December 2003. Ms. Govatos has performed at the Marlboro, Salzburg, Saratoga, Marblehead, and Music at Gretna festivals and has given concerts and master classes at UCLA, Mt. Holyoke College, the University of Delaware, Bucknell University, and Westminster Choir College of Rider University. In 1990 she became music director of the Delaware Chamber Music Festival. She is a frequent guest artist with the Lenape Chamber Ensemble and The Philadelphia Orchestra’s Chamber Music Series, a member of the Amerita Chamber Players (music of the Italian Baroque), and music director of the Hildegard Chamber Players (music of women composers. Ms. Govatos received Bachelor and Master of Music degrees from the Juilliard School as a scholarship student of Ivan Galamian. While there she won the G.B. Dealey International Competition in Dallas, the Charles Petschek Scholarship, and the Austrian American Society’s scholarship for study at the Mozarteum in Salzburg. Her initial studies were with Sabina K. Girvan and Jascha Brodsky, and she was mentored by chamber music greats Felix Galimir, Pina Carmirelli, Josef Gingold, Robert Mann, and Mischa Schneider. Ms. Govatos’s violin was made by the brothers Girolamo and Antonio Amati in Cremona in 1619. American pianist Marcantonio Barone made his début at the age of ten at a Philadelphia Orchestra children's concert. He returned in 1990 as soloist with the Orchestra's subscription series under the direction of William Smith. He has also performed as soloist with the St. Louis Symphony, Houston Symphony, Moscow Symphony Orchestra, and Birmingham Symphony Orchestra, among others. He has collaborated with such eminent conductors as Sir Simon Rattle, Leon Fleisher, Arther Fiedler, and Barry Tuckwell. His recital engagements in America and abroad have included Carnegie Hall's Weill Recital Hall, Wigmore Hall, the Metropolitan Museum, and the National Gallery. A prize winner at both the 1985 Busoni and 1987 Leeds Competitions, Mr. Barone also won the 1996-97 Musical Fund Society Award. He performs chamber music frequently with the Lenape Chamber Ensemble, 1807 and Friends, Orchestra 2001, and many other groups. An active champion of New Music, he has given the world premiere performances of works by several distinguished composers, including George Rochberg, David Finko, and Gerald Levinson. In addition to his duties at Swarthmore, Mr. Barone is also on the faculty of the Bryn Mawr Conservatory, where he is head of the piano department." "Certain pieces of music, Mussorgsky’s PICTURES AT AN EXHIBITION among them, are so stamped by famous performances that it is hard for new performances to carry any kind of freshness. The dueling recordings of Horowitz and Richter, now both over a half-century old, continue to inform the way we hear this music and, consequently, how it’s performed. Barone, without in any way violating the intent of the composer, managed to find a distinctive way with the score, via dazzling virtuosity. That’s a neat trick; Marcantonio Barone is a superb pianist whom many Philadelphians may take for granted, as he has been on the scene here since his child prodigy days in the 1970s. We shouldn’t. Barone is a world-class artist, and we’re fortunate to have him as a vital member of our local musical community."